Have you ever thought or said, “I feel so bad for her, she just can’t seem to accept reality.” Or, “he’s in complete denial.” Have you ever been in denial yourself? At one time or another, to varying degrees, I suppose we’ve all rejected the harsh reality of traumatic events or difficult times. We do our best (or worst) to suppress feelings that we don’t want to deal with … only to realize that the pain just won’t go away. The distressing death of a loved one, the lamenting loss of a job, a pitiful plunge into bankruptcy, or a brutal betrayal by a spouse or close friend. Things that are too agonizing to even think about. Is it possible for an ancient race of people miraculously reborn as a modern nation to be in denial? For an entire religion to rationalize the reasons for and results of the foundational fragmentation of their faith? That is exactly what has happened to the Jewish faith and Jewish people. Down through the centuries, even the most astute Rabbis and dedicated teachers of the Law have not been able to fully clarify why or how the God-given requirements for the sacrificial shedding of blood was so abruptly halted when the Romans ruthlessly destroyed the 2nd Temple. The most common substitutionary explanation for the loss of life-giving sacrificial atonement is that perhaps God would accept those who strive to be worthy of redemption, who faithfully recite the Sh’ma (Hear O Israel the Lord our God, the Lord is One), and who commit to God’s commandments as faithfully as possible, including observance of Sabbath and Annual Festivals. In denial, however, that even the first High Priest, Aaron, had to offer sacrifices for his own sin before he could mediate between God and the people. As detailed in last week’s article, the Law of Moses constitutes the heart and soul of Judaism. Yet, the Mosaic Law was based on two equal, co-existing foundations: (1) the laws, decrees, and regulations given by the God of Abraham, Isaac, and Jacob, as represented by and summarized in the Ten Commandments. (2) The Levitical Sacrificial System so absolutely vital for atonement and redemption. Had the Jews been able to keep God’s commandments, there would have been no need for the shedding of innocent animal blood as an atoning sacrifice for their sins. Before Moses died, he predicted that his people would (soon) disobey and turn from God individually and as a nation; which is precisely what happened. Other than the Reign of King David and the early years of King Solomon, this departure from God became progressively worse until they fully exhausted God’s patience. First, the northern kingdom of Israel fell to the Assyrians; then the southern kingdom of Judah and the Temple were destroyed by the Babylonians. A dwelling place for God’s glory, for his very presence among the Jews. First the Tabernacle: “Then the cloud covered the Tabernacle, and the glory of the Lord filled the Tabernacle” (Exodus 40:34). Then, the Temple: “…At that moment a thick cloud filled the Temple of the Lord. The priests could not continue their service because of the cloud, for the glorious presence of the Lord filled the Temple of God” (II Chronicles 5:13-14). Obviously, God did not need an earthly dwelling place built by man. His principal abode was and always will be Heaven. His presence in the Temple was for the benefit of the Jews; to demonstrate that he was able and willing to live among his people. Not unlike when God walked and talked with Adam and Eve in the Garden. This is exactly what Messiah did when he came to this earth as a man; he tabernacled (dwelled) among his people. Immanuel … God with us! And will do so again at his magnificent reappearance on the Mount of Olives to rescue his people from annihilation. Then to set up the Kingdom of God on earth. The prescribed place for daily, monthly, and annual sin and peace sacrifices as a redemptive offering for the sins of the individual and the nation; culminating in the Yom Kippur sacrifices (Day of Atonement) once a year. Although sacrifices were permitted in designated places throughout the Promised Land, the Tabernacle and then the Temple were the ultimate, central sites for offerings. Also, the men of Israel were required to attend three of the annual festivals in Jerusalem, all of which involved sacrificial offerings. To repeat the basic premise as set forth in last week’s article: No Temple, no sacrifices. No sacrifices, no forgiveness of sin. No forgiveness of sin, no redemption. And, we can include one more principle: No redemption, no right relationship with God. Since the devastating destruction of their 2nd Temple and the disastrous Dispersion of Jews throughout the world, they have been trying to figure out a way to deal with and compensate for the required atonement offerings that were such an integral component of their faith in and relationship with the Lord God. Consequently, even more sects of Judaism have developed since the basic Biblical division between Pharisees and Sadducees. To a large degree, today’s branches within the Jewish religion are predicated on diverse reactions and adjustments to the loss of the Temple. In Orthodox and ultra-Orthodox Judaism, the Temple is frequently and fervently mentioned in their services and writings, including passionate preparation for the rebuilding of the third Temple. Conservative Jews periodically talk about the Temple and its’ restoration, but pretty much exclude any reference to Temple sacrifices. The Reform Movement of Judaism downplays the significance of the Temple and the need for any such thing as sacrificial shedding of blood. Many liberal Jews actually resist the idea of a rebuilt Temple, citing adverse political and social repercussions with Arabs, but even among Israelis. Likewise, the tenets of the Jewish faith expressed primarily through Halakha (the Jewish law, and the right paths to walk in that law) vary in intensity and observance based on the sect of Judaism. However, the common thread is that Mitzvah or good deeds through keeping Torah commandments revealed by God and Rabbinical interpretations and application of those instructions as found in the Talmud and Mishnah is really the only way to approach, appease, and otherwise please God. Yet, many laws pertaining to the Old Testament rules for holiness and purity are no longer practiced; because the Temple no longer exists and (therefore) neither do the Sacrificial Offerings that were irrevocably and unequivocally required by God, as the only means of cleansing and forgiveness—both ceremonially (externally) and spiritually (internally … the heart). What happened on the 9th of Av, which is mid-July to mid-August on the Gregorian calendar? It is the exact day that Solomon’s temple was callously destroyed by the Babylonians under King Nebuchadnezzar in 586 BC. AND, it was also the same exact day that the 2nd Temple was systematically demolished by the Romans under General Titus in 70 AD. The fact that the two worst events of Jewish history occurred on the same calendar day does not escape their contemplation and certainly not their attention. Ironically, nearly all Jews are aware of and some 75% of Jews solemnly observe Tisha B’Av (literally the 9th day of the Jewish month of Av) in varying degrees of reflection and meditation. Thus, they are not so much in denial of the indescribable loss of the Temple itself; as they are in denial of the incredible consequence that cessation of the Temple sacrificial offerings caused in their relationship with God. There’s no getting around it: The individual and national Jewish interaction and standing with God was dramatically altered when the very presence of God left Solomon’s Temple; then the sacrificial altars and instruments were destroyed along with the entire 2nd Temple. Preceded by the mysterious, miraculous splitting in two of the Holy of Holies curtain as a Jewish Rabbi died on a cross just outside of Jerusalem. There are other catastrophic occurrences in Jewish history that took place on the 9th of Av or days very close to that date. For example, the return of the 12 Jewish spies sent by Moses to check out the Promised Land of Canaan; only for ten of the spies to adversely persuade the Israelites to disobey God and Moses by not entering the land out of fear of the enemy. In short, they simply refused to trust the same God who had already performed mighty miracles in their deliverance from slavery and escape from Pharaoh’s pursing army. God’s ensuing punishment included 40 years of wandering in the wilderness, one year for each day the spies were in Canaan. On the 9th of Av in 1941, SS Chief, Heinrich Himmler, received approval orders for the Final Solution of the Jews, which began the worst genocide of all time … the Holocaust. Likewise, on that date in 1942, Jews of the Warsaw Ghetto were deported to concentration camps. The point is: Even Jewish Rabbis, especially rabbis, recognize God’s hand of discipline and punishment in these events. How could they not? As difficult as the concept is to grasp and accept, the fact remains that God, himself, predicted and authorized severe judgment on his people if they failed to obey his laws and keep the Sabbath or Sabbath years of resting the land, and also the sacrifice of innocent animals without true repentance of the heart. This dire warning from God actually came first with the Mosaic Law cherished so deeply by the Jewish people. Still, hundreds of years of Jewish disobedience elapsed before God’s patience finally ran out. Please refer to the entire chapter of Leviticus 26 for a step-by-step description of the progressive phases of Israel’s discipline, culminating in being conquered by and exiled to foreign pagan nations. “I have heard your prayer and have chosen this Temple as the place for making sacrifices. At times I might shut up the heavens so that no rain falls, or command grasshoppers to devour your crops, or send plagues among you. Then if my people who are called by my name will humble themselves and pray and seek my face and turn from their wicked ways, I will hear from heaven and will forgive their sins and restore their land. My eyes will be open and my ears attentive to every prayer made in this place. For I have chosen this Temple and set it apart to be holy—a place where my name will be honored forever. I will always watch over it, for it is dear to my heart” (II Chronicles 7:12-16). “As for you, if you faithfully follow me as David your father did, obeying all my commands, decrees, and regulations, then I will establish the throne of your dynasty. For I made this covenant with father, David, when I said, ‘One of your descendants will always rule over Israel.’ But if you or your descendants abandon me and disobey the decrees and commands I have given you, and if you serve and worship other gods, then I will uproot the people from this land that I have given them. I will reject this Temple that I have made holy to honor my name. I will make it an object of mockery and ridicule among the nations. And though this Temple is impressive now, all who pass by will be appalled. They will ask, ‘Why did the Lord do such terrible things to this land and to this Temple?’ And the answer will be, ‘Because his people abandoned the Lord, the God of their ancestors, who brought them out of Egypt, and they worshipped other gods instead and bowed down to them. That is why he has brought all these disasters on them’” (II Chronicles 7:17-22). The “One” descendant of David who (someday) will always (forever) rule and reign over Israel, indeed, the entire world, is Messiah. When he returns, he will bring the heavenly Temple with him … himself. Though temple sacrifices resumed when the 2nd Tempe was rebuilt, the Shekinah Glory of God never returned. That is, until the essence and image of God’s glory was placed in and on God’s Son, Yeshua HaMashiach—who walked, taught, prayed, and healed others in the 2nd Temple. When Jesus returns he will come in power and great glory (Luke 21:27). There will be a 3rd Temple in Jerusalem before Christ returns, but Messiah himself will be the center of attention and attraction. Nearly all Jews, both religious and secular, long for the coming of Messiah. In fact, many Jews believe that the 3rd Temple won’t be rebuilt until Messiah appears. Orthodox Jews long for the resumption of redemptive sacrifices in the Temple, and return of the Shekinah Glory of God to the Temple. Even the Reform movement within Judaism recognizes that without a rebuilt Temple, the very essence of sacrificial atonement for sin has been compromised, if not lost entirely. 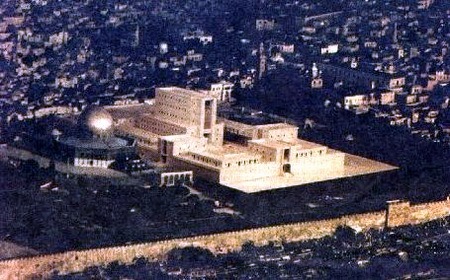 Thus, they and the more liberal Jews downplay the importance of a rebuilt Temple; because to overemphasize the Temple’s significance would be to endorse the need for divine rescue from sin, which has been replaced almost exclusively with keeping the Mosaic Commandments as the only means of right standing with God. The question must be asked and answered: If anyone’s belief system and life conduct is predicated on earning God’s favor or forgiveness by adhering to the Law of Moses (to whatever degree it is followed), then the ENTIRE Mosaic covenant must be kept. This includes animal sacrifices to cover sins and ensure an ongoing relationship with God. There’s no indication, whatsoever, in the Mosaic Law or anywhere else in Scripture that the Law itself could save even those who did their very best to keep it. Thus, God’s remedy of the shedding of innocent blood for remission of sin is the only answer to breaking God’s laws. Yet, as we’ve seen, God, himself orchestrated the destruction of the Temples, just as he told Solomon he would do, and as he warned Israel through other prophets like Isaiah, Jeremiah, and Ezekiel. When the first and then the second Temple was destroyed, it’s conceivable the Jews could rightfully plead that the only recourse left to them was trying to do the best they could; hopefully God would accept good deeds over the wrong things they had done. But to fall back on that rationale is to deny the very reason that the Solomon’s Temple was destroyed: Israel’s “detestable sins” as so graphically depicted in Ezekiel Chapters 8 & 9. Why would God drastically change the pathway of atonement and salvation that he made even before the foundation of the world, to accommodate the loss of the Temples? The fact is: He didn’t. What he did replace was the temporary, on-going covering of sin by the innocent blood of animals, with the actual removal of sin through the permanent, once-for-all greatest Sacrifice of all time: The shed blood of God’s very Son … The Perfect Sacrifice by the Perfect High Priest. For those Jews who understood and accepted the reasons for destruction of the first Temple, the obliteration of the 2nd Temple was virtually unfathomable. Explanations such as disunity among 1st century Jewish groups, or a premature, poorly planned uprising against Rome led by disorganized zealots are frequently cited as reasons that led to the heart-rending loss of their 2nd Temple. Worse: the expulsion of Jews from Israel, scattered to the four-winds, living under suppression and oppression of Gentile nations for nearly two thousand years. With complete denial (Messianic Jews excepted) that this destruction was predicted by Jesus, himself, less than forty years before it happened. That this Great Dispersion was a resumption of God’s discipline of Israel, this time for rejection of her Messiah. Still today, other than tens of thousands of Messianic Jews all over the world, Jesus is not recognized in Judaism as the Messiah. This, despite dozens of Old Testament prophecies that were meticulously fulfilled with the birth, life, death, and resurrection of Yeshua. One of these prophecies spectacularly announces that Messiah was to arrive before the destruction of the 2nd Temple. Moreover, this amazing prophecy came from Daniel before the 2nd Temple had been built! Read with me this phenomenal prediction: “After this period of sixty-two sets of seven, the Anointed One will be killed, appearing to have accomplished nothing, and a ruler will arise whose armies will destroy the city and the Temple” (Daniel 9:26a). This verse and others in Daniel have been the subject of several past Eye of Prophecy articles, focusing primarily on the ruler whose armies would destroy the Temple. Here, the emphasis is on the Anointed One (Messiah) who would be killed (with obvious implication that he was alive) BEFORE the Temple was destroyed. The very birth of Jesus Christ separated time itself (BC … AD); then his death and resurrection around 32 AD, some 38 years before the Temple was utterly demolished by the Roman legions … which had been ordered specifically by the ruler (Nero) to crush the revolt in Israel. Sadly, so many Jewish rabbis and teachers of the law have missed, dismissed, minimized, ignored, or denied these historical facts. Yet, if Messiah didn’t arrive when Daniel said he would, then the 2nd Temple wasn’t destroyed. It would still be standing. To say that the Temple is still with us would be an obvious illogical denial of what actually happened or that the Temple was even built in the first place. Which, in turn, would be a complete denial of Biblical, historical, and archeological evidence. Jewish scholars are among the best in the world. They see things that many of us don’t see. But when it comes to Jesus, they can only twist and turn the Torah to fit their ancient and modern rejection of Jesus as Messiah. If they would only read the New Testament with an open mind, then match it and history with so many Old Covenant prophecies of Messiah. Then, as gut-wrenchingly difficult as it would be: To somehow set aside the horror of the Crusades, Inquisitions, and Holocaust—perpetrated not by true believers in Jesus; but by those who diabolically used the name of Christ or Christians to achieve their warped goal of persecuting and destroying the Jewish race or by replacing Biblical promises made exclusively to Israel with the Church. Anyone who has read my books or Eye of Prophecy articles, will clearly see that I love and support Israel and her people. But in the vein of the Apostle Paul, this love for the Jews compels me to ask this poignant and probing question. Unless it is answered by both Jew and Gentile, the Jewish faith and trust in the Mosaic Law remains incomplete; indeed, inadequate to accomplish the ultimate goal of a redemptive relationship with God. This, of course, is also true for all peoples, but it was the Jews who were chosen by God to be a light to the Gentiles. As Jesus said to the Gentile Samaritan woman: Salvation comes through the Jews. (John 4:22). Where is the Temple? Where is the God-ordained place of sacrificial atonement for the sins of the people and nation of Israel, for the whole world? Would God allow the Temples to be destroyed and, thus, the very means of sacrificial redemption to be abolished, without remedy? To leave the Jews and all men and women without hope of eternal salvation? The sacrifices of animals was not designed to remove sin, only to cover it day-to-day and year to year. The Tabernacle and later the Temple was a prototype reflection of the heavenly pattern, a temporary means to prepare the way for the real heavenly Temple. There would be a New Covenant (Jeremiah 31) to replace the old. A new and much better way of redemption … a once for all permanent removal of the penalty of sin. In short, to fully realize that there was a Divine purpose, a providential sovereignty in making something good (better) out of something so devastating as the very destruction of the Temple and subsequent loss of half of the Mosaic Law … the means of atonement for sin. The Old Covenant has been replaced by a New Covenant!